Great! You're ready for some more XPL0 programming. This is a continuation of "Creating Demos in XPL0." Like the previous article, this is inspired by Polaris's tutorials in Hugi 31. Here we'll build upon the 3D wireframe introduced in his Tutorial #7. We'll use the classic torus as our subject, and cook up a recipe for turning it into a donut. All the code and executables are in the bonus pack in torusxpl.zip. You need to run the programs to appreciate the speed that the images are drawn. They run under DOS and most versions of Windows. The programs are terminated by pressing the Esc key. Some depend on the file texture.bmp, which prevents them from being run directly from the zip file under Windows. You must extract those programs into a folder. You'll get hopelessly confused if you don't know which way is which. The examples here use a right-handed coordinate system with the Z axis going into the screen. Other graphic systems, such as DirectX and OpenGL, use different conventions. It isn't important which convention you use as long as you stick to it throughout a program. The first example is very short just to get the ball rolling - or rather the torus tumbling. The SetUp procedure (see below) uses some sines and cosines to define a series of points on the surface of a torus. The Draw procedure connects these points with a network of lines to form a wireframe image. 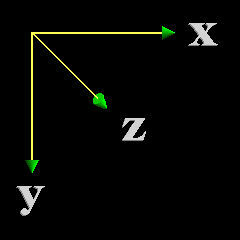 The Rotate procedure rotates these points about the X, Y and Z axes. They are moved a small amount each time the procedure is called. The Rotate procedure is probably the most mysterious of the bunch. It uses difference equations to approximate sines and cosines of small angles. Sines and cosines, of course, are the standard way to rotate a point in analytic geometry. The advantage of the difference equations is they are simple and fast compared to floating-point sines and cosines. This was important once upon a time, but not so much now with the capabilities of modern processors. There is however a problem with this technique. It accumulates errors. If you run Torus1 for a minute or two, you'll see something interesting. \Find the coordinates of the vertexes of facets that approximate a torus. \ torus is initially in the X,Y plane (like a donut floating in hot grease). The second version of our program elaborates on Torus1 by making it interactive. It uses the mouse and keyboard to manipulate the image. This also solves the problem of accumulating errors in the rotation calculations. You may have noticed that these eventually caused the torus to get bent all out of shape. The new procedures RotateTorus and Rotate use the mouse to rotate the image. RotateTorus gets angles from the mouse and uses them to rotate a reference frame by calling Rotate. Rotate uses sine and cosine calculations to rotate the reference frame about the X, Y and Z axes. The code shows the standard matrix notation that is typically used. A matrix multiply is applied to each point (vertex) in the torus to align it with the rotated reference frame. The rest of the code is relatively easy to understand. It uses keyboard commands to adjust the number of sectors and sections in the torus. GetKey and CallInt are simple routines that facilitate calls to BIOS. 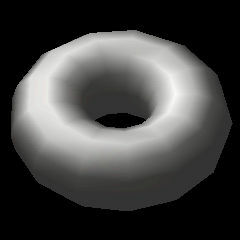 If you hold down the arrow keys, you can get a well-rounded torus. \Inputs: Sectors, Sections, TorX, TorY, TorZ. \Rotate reference frame according to changes in mouse position. \ accurately calculated to 16 decimal places. This version of our Torus program increases realism by replacing the wireframe with solid surfaces. To make the surfaces colorful, and to draw them quickly, we take advantage of VESA graphics and 32-bit XPL0. The major changes to the code are a DrawPoly procedure and a couple sort procedures. DrawPoly draws a filled polygon, or in our case, a 4-sided figure called a "quad." Instead of drawing directly on the screen, DrawPoly draws onto a buffer named Image. This buffer is then copied to the screen using the Paint intrinsic. This technique eliminates the flicker noticeable in Torus1 and Torus2. With the wireframe models it didn't matter which order the lines were drawn, but with solid surfaces it's essential that the back surfaces never obscure the front ones. This is where the sort routines come in. The surfaces are sorted according to their distance from the viewer. In other words, they are sorted according to their Z-axis positions, or depth. 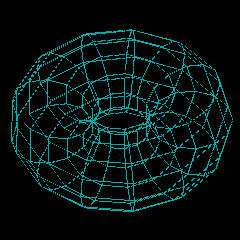 DrawTorus then draws the surfaces starting with the one with the greatest Z position and works its way toward the front. This technique is known as the Painter's Algorithm. The Image buffer not only eliminates flicker, but it also prevents showing all the overpainting that's being done. When you look at the code you'll see other minor changes. WExtend is used to sign-extend the 16-bit values, returned by DOS and BIOS, to the 32-bit values used by XPL0. Also the array names are streamlined. For instance TorX, TorY and TorZ are collapsed into a single array with an extra dimension added for the X, Y and Z axes. This version shines some light on the subject, which adds another step in realism. 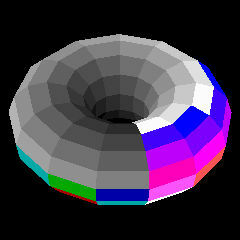 In Torus3 light was emitted by colored facets. Now, in Torus4 the facets are illuminated with two kinds of light: directional and ambient. Directional light is like the light from the sun. Ambient light is the kind of light that gets scattered around inside a room. Both are necessary. If only ambient light is used then all the facets look identical and blend together. If only directional light is used then the facets facing away from the light are invisible. In the program if you adjust Ambient all the way up and down, you'll see these effects. The amount of light that reflects from a rough, non-shiny surface depends on the direction the surface is facing. If it points directly toward a source of light then it reflects the maximum amount. If it's tilted away from the light then the intensity of the reflected light is diminished depending on the angle of tilt. The amount of reflected light is determined by Lambert's Law, which states that the intensity is proportional to the cosine of the angle between the direction of the surface and the direction of the light source. The intensity does not depend on the direction of the viewer because the reflected light is equally scattered in all directions. Vectors perpendicular to each surface, called "normal vectors," are added to the code to measure angles of tilt. The dot-product turns out to be a simple way to calculate the cosine of the angle between the normal vector and the direction of the light, which is also a vector. Speed is something that needs to be kept in mind when doing animation. Thus "Frames/second" is added to the display. This shows the number of times the screen gets redrawn each second. You can see how the various adjustments affect speed. For instance, lots of facets slow things down. This version smoothes the surface of the torus without reverting to lots of facets by using a technique called Gouraud shading. This varies the brightness of the reflected light across the face of a facet. To accomplish this an additional set of normal vectors are added at the vertices. These are the average of the adjacent surface normals that were introduced in Torus4. Lambert's Law is applied to give the intensity of the reflected light at each vertex, instead of at each face, and this provides a color for the DrawPoly procedure. DrawPoly is modified to interpolate color between vertices. First it interpolates the color along the edges of the polygon (in the procedure BuildLine). Then it interpolates the color along the horizontal scan lines that fill the area between the edges. The result is a smoothly changing gradient of color across the surface of the polygon. Interpolation only adds a small amount of overhead to the time-critical innermost loops of the code. The result is that curved surfaces can quickly be smoothly shaded without resorting to lots of facets. Here are some speed comparisons on two computers: a Duron 850 and an Athlon 2400+ with an nVidia card. The number of frames per second are shown for the reset condition (13 sectors, 13 sections, straight-on view) and for the extreme condition (63 sectors, 63 sections). Pan and zoom are simple modifications to the RotateTorus procedure. Making DrawPoly clip the image at the edge of the screen without distorting the shading is a little more involved. 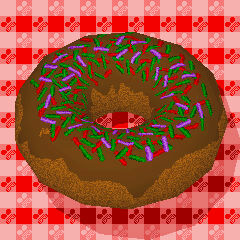 This version takes a giant leap toward realism by converting the torus into an actual donut - complete with sprinkles! "Texture mapping" is the magic new ingredient. This applies the image in the file texture.bmp onto the surface of the torus. It uses the same interpolation idea as for Gouraud shading. In addition to interpolating light intensity, DrawPoly now interpolates horizontal and vertical steps through the texture image. The colors of the pixels that get selected from this image are used to plot the pixels that fill the polygons displayed on the screen. 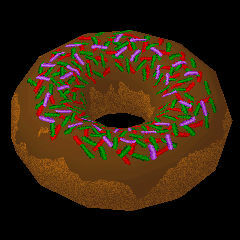 The color selected is not plotted directly, but instead its brightness is adjusted so that the donut gets shaded, giving it a 3D look. To keep the code fast this brightness adjustment is gotten from a color look-up table (CLUT), which is set up by the procedure MakeCLUT. Given a color and brightness, the table provides a shaded color. Gouraud shading can be turned on and off using the G key. This lets you see the tradeoff in speed and appearance for various numbers of facets. 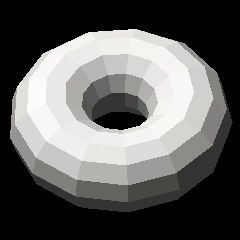 Notice that while Gouraud shading is effective in smoothing (especially the underside of the donut) it does nothing to smooth the edges of the silhouette. Gouraud shading definitely looks better than flat shading when there are only 13x13 facets; but when there are 63x63 facets, it's little, if any, improvement. However, 63x63 facets take a long time to render. Alas, a shadow has finally fallen on this project. This version adds two new procedures: DrawBkgnd provides a background image, so the shadow has something to fall upon; and DrawShadow provides the shadow. DrawBkgnd does a series of calls to DrawPoly to provide a checkered tablecloth. It's drawn in the X-Y plane at Z=0. Shadow, Torus and Light are 3D vectors. Light is a unit vector that when multiplied by the (1D) scalar "dist" gives a vector from a point on the torus to the corresponding point in its shadow. Since the Z component of Shadow is 0, equations for the X and Y components can easily be derived. Shadow(X) and Shadow(Y) are the coordinates that DrawPoly needs to draw the shadows on the tablecloth for each of the polygons that make up the torus. This is difficult to follow, I know. At least you have the highlights (no pun intended) and can dig out the details in the code if you desire. Unlike with DirectX or even OpenGL everything is there. Once you plow through that, you'll understand everything - or at least enough to start building your own 3D engine.